The birds are flying. The birds are flocking. The birds know where to find her. One man is driven by a Voice that isn’t his. It’s killing his sanity and wrestling with it over and over like a jackal with a bone. He has one goal. To find the girl with a Voice like his own. She has no one to defend her now. The hunt is on. But in an Inn by the sea, a boy with no tongue and no Voice gathers his warriors. Albus must find Lacey … before the Other does. And finish the work his sister, Ruby began. Sequel to the utterly brilliant Defender (one of my books of the year for 2017) we now have Hunted. And boy, what a hunt it is. It’s going to be hard to talk about this book without spoiling anything, but trust me on this. If you read and loved Defender, you *need* to read this. Pick up a copy, set aside a day, stockpile the biscuits, take the phone off the hook and strap yourself in for the chase. And if you’ve not read Defender (what’s wrong with you?? ), go pick up that too (along with extra biscuits), and brace yourself for some of the finest dystopian worldbuilding you’re likely to see this side of the apocalypse. 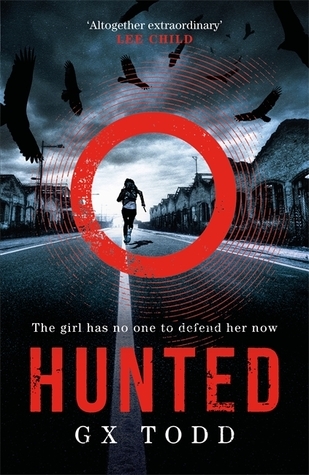 Hunted takes the beautifully realised world of Defender, with it’s panoply of fantastic (albeit unpleasant in some cases) characters and expands the mythos. Those voices grow louder, the dystopia grows even more widescreen cinematic in scope, and the ending? Holy moly. You are not ready for that ending. It’s a proper Empire Strikes Back kind of moment. Bereft, yet with a glimmer of hope that some things might just come right in the end. Book three cannot come soon enough. You can find GX Todd on twitter @GemTodd. Many thanks to Headline for the review copy.